Inspired by the impending release of the Polar Lights TOS Enterprise kit, ParaGrafix has revisited one of our first products, improving it with techniques acquired since the design was first made and reference images that have come to light. Pricing remains the same as it did for the original design. 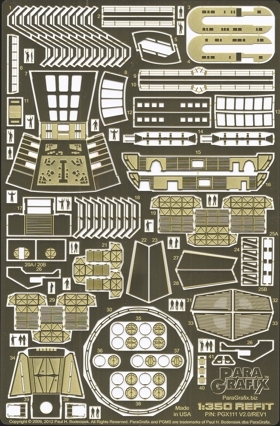 Girders and railings for the shuttlebay, including pieces to hide the seams at the two "steps"
* These parts are included on the 1/350 REFIT Supplemental Photoetch Set (PF166). You do not need to purchase that set if you purchase this one. ** These parts suitable for use with either the original kit parts or the upgraded items available from Don's Light and Magic.